I used to think of Athens as a big, ugly city with obligatory ancient sights, fine museums, the Plaka (an extremely touristy old quarter), and not much else. "The joy of Greece is outside of Athens," I wrote. "See the museums and scram." But while updating my guidebook last summer, I enjoyed the city more than ever before. I discovered a place that's getting its act together, despite Greece's economic crisis. I had a great experience, even though it was the worst time of year for a visit. It was sweltering -- well over 100 degrees -- and since it was mid-August, most Athenians were gone, finding relief on the beach. Still, there was an energy in Athens that made me want to come back and linger ... in the winter. I discovered much of that energy in the offbeat parts of the city, thanks to Matt Barrett, who splits his time between Greece and North Carolina. He splashes through his adopted hometown like a kid in a wading pool, enthusiastically sharing his discoveries and observations on his generous website (www.athensguide.com). He took me to Exarchia, which is sometimes called the "New Berlin," a student district just a short walk from Athens' Omonia Square. This is the home of the anarchists who are the firepower behind Athens' street protests, a place covered in colorful graffiti -- making it defiant, artsy, and full of life. From the small Exarchia Square, side streets spin off into grungy neighborhoods. Mainstream businesses tend to steer clear of this area; instead, streets are lined with alternative boutiques, record stores, and cafes. About two blocks south of the main square -- at the corner of Mesolongiou and Tzabella streets -- is a memorial to Alexandros Grigoropoulos, a local teen who was shot and killed here in December 2008 when two policemen fired into a group of angry youths. The incident sparked an attention-grabbing wave of riots across Greece, and ever since, frustrated neighbors have kept the cops out and do their own policing. The juxtaposition between Exarchia and the adjacent, very ritzy Kolonaki district makes the tragedy even more poignant. With its penchant for riots and protests, Exarchia may feel less secure than other Athens neighborhoods. For some people, this is the seedy underbelly of Athens they came to see; others can't wait to get back to the predictable souvlaki stands and leather salesmen of the Plaka. A more up-and-coming Athens neighborhood is the Psyrri district north of the Acropolis. Until recently, it was a grimy area of workshops and cottage industries, famous locally as a onetime hotbed of poets, musicians, revolutionaries, and troublemakers. 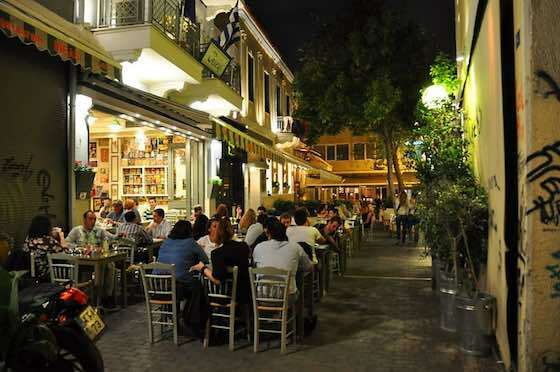 But now it's taking off as one of central Athens' top after-hours zones. The mix of trendy and crusty gives the area a unique charm. The options include slick, touristy tavernas with live traditional music; highly conceptual cafe/bars catering to cool young Athenians; and clubs with DJs or live music for partying the night away. The epicenter of the restaurant area is between two squares, Iroon and Agii Anargiri, and along the street that connects them. If you're seeking nightlife, explore the streets spinning off from this central axis. Lepeniotou Street has the most creatively themed cafe/bars -- most of them mellow and colorful, and great spots to relax with a drink and to appreciate the decor. Each one has its own personality and idiosyncratic sense of style (from Lebanese to Argentinean). Wander around a bit looking for the place that suits you. Farther to the west is the Gazi neighborhood. As a center of Athens' gay community, the area has a special flamboyance and style. Residents here must be dizzy at the rapid change sweeping through what was just recently a depressed industrial zone. Towering overhead are the square, brick smokestacks of Technopolis, a complex of warehouses and brick factory buildings that now host an eclectic assortment of art exhibits, rock concerts, and experimental theater. The smokestacks are illuminated in red after dark, giving an eerie impression of the neighborhood's former industrial activity. The only permanent exhibit within Technopolis is a free museum dedicated to Greek diva Maria Callas, who had her heart broken when Ari left her for Jackie Kennedy. Athens is hugely improved and filled with youthful energy. Yes, there's some economic distress, but most strikes are nuisance strikes -- just a day or two here and there, and generally not prolonged. There's an upside to the downturn: Because of the weak economy, you'll find great deals on hotel rooms -- and fewer crowds. Today's Athens is much more people-friendly, an urban scene of pedestrian boulevards and squares filled with benches, shade-giving trees, and inviting cafes. While its drawing power will always be its classic ancient sights, take time to taste its spicy, mod neighborhoods. Athens, the thriving capital of Greece sprawls out from the foot of its magnificent Acropolis. We'll tour the must-sees of ancient Athens: the Parthenon, Agora, and amazing National Archaeological Museum. We'll take the fast-paced pulse of the modern city, but waste no time getting to Rick's favorite side-trip destinations: the ruins of the mystical oracle at Delphi and a fast boat to the romantic, traffic-free isle of Hydra. Vacations & Travel "Athens, Greece: Offbeat Athens"